Brace yourself for potential delays to your auto body repair resulting from winter storms in 2014! 2014 has started off with a literal bang for most of the country. Winter has spread its icy grip into areas of the southern USA that we take for granted as being immune to ice and snow. Regardless of whether or not you live in the Deep South, if you have been involved in a car accident this winter, your inconveniences could become stratospheric. Why might my auto body repair be impacted by the winter weather? The sheer volume of collisions across the county is bound to have a ripple effect in several ways that will impact your winter weather related auto body repair. In one day in Atlanta Georgia there were 1,254 car accidents. In North Carolina, state patrol officers responded to more than 3,000 service calls, including 600 collisions. In South Carolina there were 800 car accidents. This is all in the same day folks! AutoBody-Review.com is headquartered in Sunny Southern California, but I live just outside of Baltimore Maryland. It has been snowing regularly since early December. Last week we got about 8-10” of snow and in one day there were over 30 serious car accidents reported in my county alone which is only 527 square miles and about 250,000 people. And we know how to drive in snow up here! 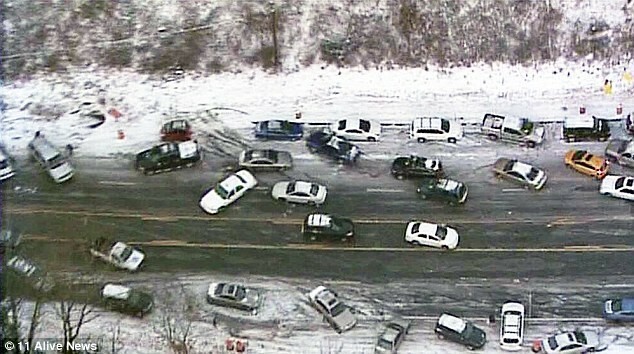 So as this odd winter creeps into places where snow is not usually found, car collisions have become outright epidemic. Officers didn’t make it out to you to file an accident report. In areas where severe winter weather is not very frequent, the police are on “accident alert” and don’t always come to the scene unless the vehicle has flipped, someone is bleeding to death, or it looks like someone is drunk. Many times they simply can’t make it out to you as was the case in the deep south. With road conditions this bad, there were hundreds of crashes going on simultaneously. When you do get in a collision in winter it is not un common for witnesses to leave because it’s cold and they want to get home. Little, if any, proper documents are exchanged at the scene that implicate the at-fault driver. If you call the police, they will often advise you to just exchange information unless a driver is drunk or injuries require an ambulance, and instead, file a counter report within 72 hours. How likely do you think it is that the other driver’s insurance company will accept and pay this claim? The answer is: not very. In fact, under this scenario, the only chance you have is if the driver himself admits to his insurance company when they contact him that he was at fault. Believe it or not, that rarely happens. Short of that confession, rest assured the claim could be denied. This of course is only relevant in at-fault states; your state might be a no-fault state. If you are in a no-fault state, or your claim gets denied, your insurance company will pay for your damages, or deal in replacing the vehicle if it is declared totaled. My advice is to try and document the scene of the accident, and photograph any damages and submit them to the other driver’s insurance company, but be prepared to have to go it alone on this one. 2. The winter storm 2014 auto body insurance claim process will be delayed. As I mentioned, my little town had 30 accidents in one day. That is 30 claims for the local claims adjusters to process, and it is going to take longer for them to get to yours especially if there are several in process ahead of yours. I can’t even imagine what it will be like in Atlanta where the number of crashes seems to be the highest. Try and be patient. In times of high claim volume, claims adjusters are more likely to accept (or deny) liability and to move forward with the coverage investigation in order to move the process along. The best thing to do is to try to get all of your information ready, so when your claim is ready to be processed, you can easily get it processed and paid. The information that you need to get are the other driver’s insurance information, and find out where your car is and where your car will be fixed. If you did have a police report, have that ready as well as any photos taken at the scene of the accident if you happened to take any. 3. The auto body shop you select will have a longer than normal waiting time. Body shops around here are booking late into March and it is not even February yet. That’s right- two months or more of just waiting. So if your car is still drivable, count yourself lucky. If your car gets totaled, you might want to read my advice on what to do here. If your car is not drivable, be prepared for some hefty rental car bills or for bumming rides to work for a while. I wouldn’t be surprised if there is an immediate shortage of rental cars in some metro areas. 4. There could be a shortage of car parts for your autobody repair. I don’t know this for a fact yet, so please do not panic. However I do know that one of the common causes of auto body repair delays is parts availability. With unusually high volume of states hit with absurd weather this winter, the number of crashes is exponential. Some areas might simply be out of stock especially on very common vehicles like the typical average American commuter car. In addition, the average age of vehicles on the road now is 11.4 years old as of 2013 and the parts to fix your vehicle might not be in production anymore making replacement parts longer and harder to locate and get shipped. Now these are merely suggestions and the decisions about the safety of the repair should be left up to your auto body repair shop, and will likely be determined by your insurance company. Ask if you can use salvage parts. For things like replacement doors, fenders, hoods, etc, all shops prefer to use replacement parts made by the same people who made your car (called OEM parts). In many cases they are required to use aftermarket parts. But if there are going to be delays in getting any of those parts, ask if a “recycled part” could be used to speed things along. These are original parts, they are just used. Call ALL the local auto body repair shops for openings. Just because your insurance company recommended a particular shop to you, does not mean that you have to use that shop. You are free to take your car anywhere you want to get it repaired. Use tools like Autobody-Review.com to locate local shops read customer reviews about how fast they are turning out repairs, and even contact the shop directly. Consider taking your vehicle out of state to get repaired. If you live close to another state, perhaps that area did not get hit with the winter weather as badly as your state did. Residents of Northern Georgia could consider neighboring North Carolina where the volume of crashes was not as high. If you need your car back sooner than later, this mild inconvenience might out weigh the inconvenience of waiting months for your car to get repaired. If you want to learn how to search for great auto body repair shops, check out my advice here. So if you have been involved in a collision due to the crazy weather we received in 2014, I hope these tips can help you get through it. So hang in there, you will get through this. After all they are just cars, and cars can always be fixed or replaced. Lamonte Y. had this to say about Allen's Collision Repair, Inc.